I was seven in the summer of 1988, click when I went to a Free Mandela rally in London’s Hyde Park with my family. At the time, sales I didn’t know who he was or why I was there, pharmacy likely having been lured with the promise of a Popsicle. He slipped in and out of my consciousness in the ensuing years: my parents discussing his release from prison over dinner while I played with my food; a seventh-grade social studies class dedicated to South Africa after the monumental 1994 elections; glimpses of him on TV with presidents, in movie avatars played by Morgan Freeman, and even posing happily alongside the Spice Girls. But this man’s efforts would be turn out to be instrumental in the course of my own life: 25 years later, in 2013, I was fortunate enough to move to the nation for which he sacrificed so much of himself. My initial instinct, admittedly, was to tell him off. I am a recovering New Yorker, after all. But instead, I just apologized for offending him and moved on. People deal with grief in their own ways (his entailed partying at a posh bar, apparently), and perhaps he felt I was an outsider intruding on his nation’s private mourning? 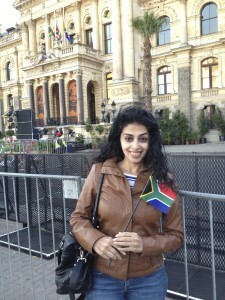 Sure, it might not have been the wisest timing for me to unleash my American accent on the streets of Cape Town. But the exchange shook me up. What right did I, an interloper — and perhaps the worst kind: an American — have to inquire about Mandela, after all? 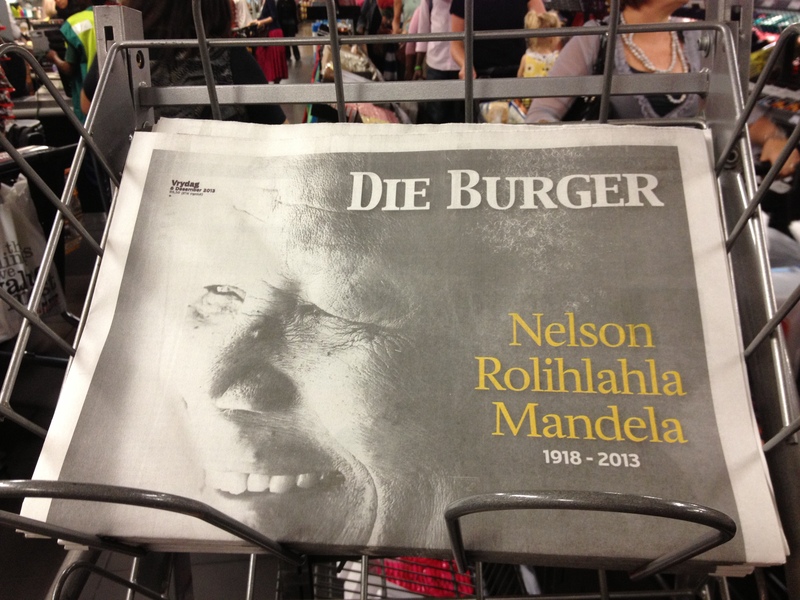 Since news of his passing broke just after midnight in South Africa, many of my new compatriots were already asleep. So that meant the outpouring of grief, the flowery homages, the tributes and tears, the RIP Mandela memes that instantaneously deluged my Facebook, Twitter, and Instagram feeds were overwhelmingly American. While I’ve always rolled my eyes at the mass melee of woe one-upmanship that surrounds celebrity deaths, this time felt different. It seemed sincere, heartfelt. The truth is, Mandela was not just South Africa’s icon. He transcended boundaries and belonged to the world — or at least, the world was eager to claim him. His unique reconciliation approach, which led to an almost unprecedented, mostly peaceful transition, is a universal lesson, one that many others across the globe could do well to follow today. 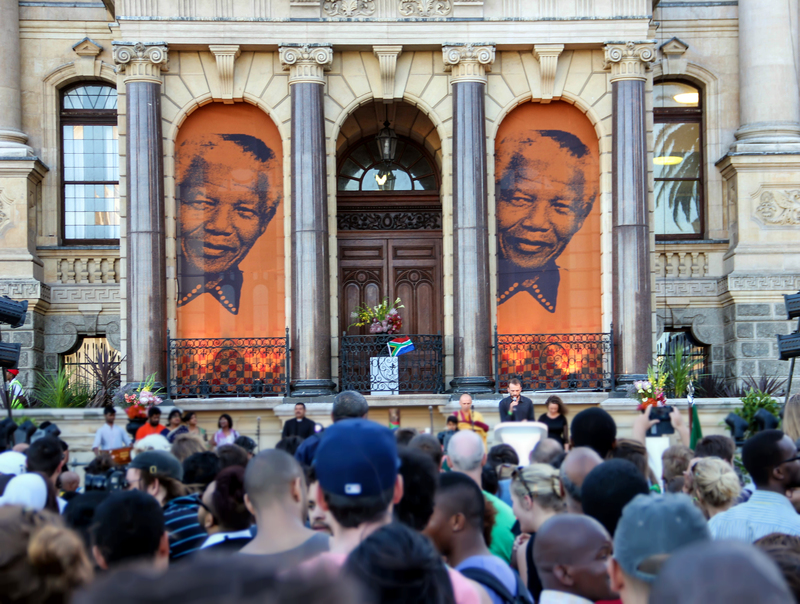 The next day I joined thousands of Capetonians converging at the Grand Parade, where Mandela had given his first address after being released from prison in 1990, feeling like a bit of an imposter for attempting to share in the nation’s collective grief. Did I really have a right, not only as an American but as someone who barely knew about South Africa before she came for an impromptu visit a year and a half ago, to mourn him? 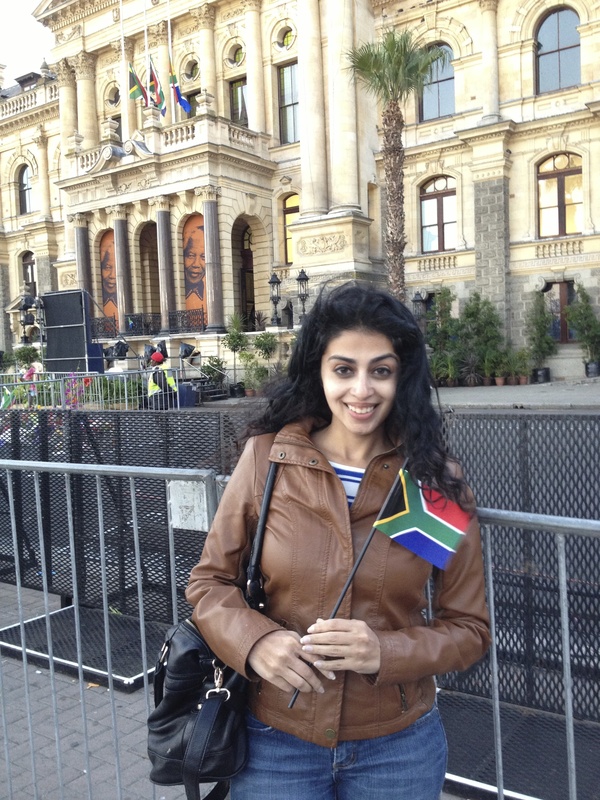 Till now, Mandela had existed on the periphery of my life. 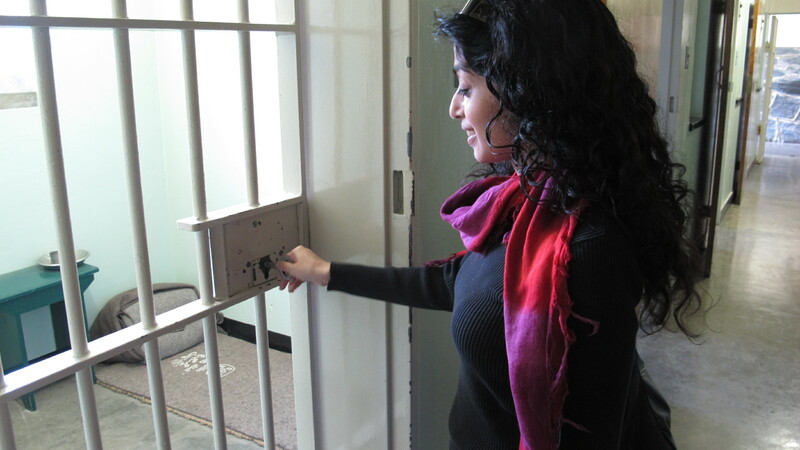 I’d visited his cell at Robben Island, and I’d seen South Africans commemorate his birthday every year by dedicating Mandela Day to community service. Entering the cell on Robben Island where Nelson Mandela spent much of his 27-year incarceration. 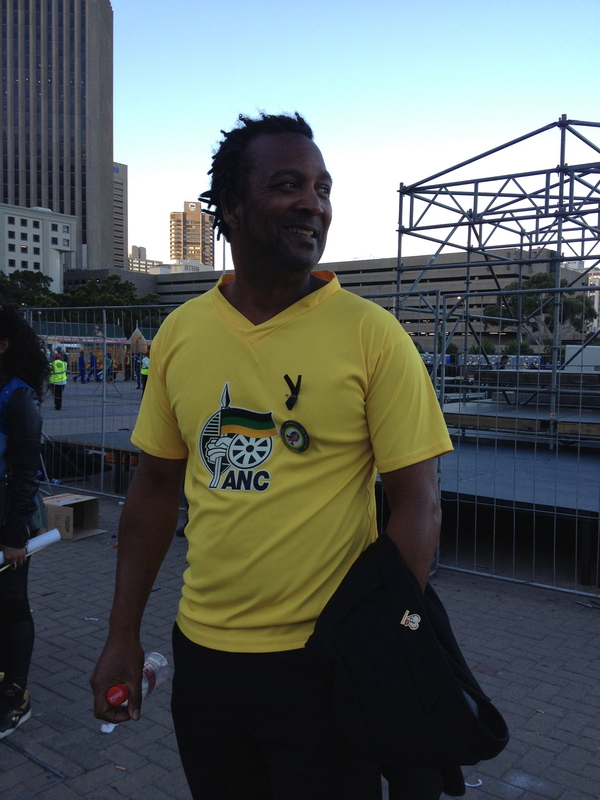 Sizwe Abrahams, one of Nelson Mandela’s bodyguards after his release from prison. 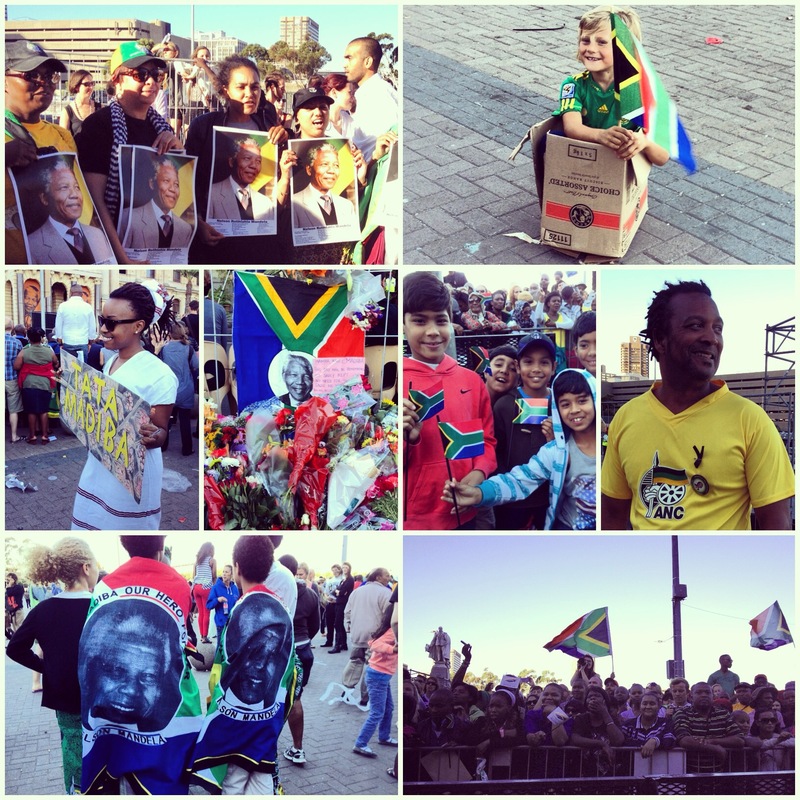 A sampling of the diverse mix of faces who came out to Cape Town’s Grand Parade to honor Madiba on Friday. A few days before his death, I watched the new movie Mandela: Long Walk to Freedom. I’m ashamed to admit that this primer was the most in-depth take on his life I’ve experienced so far. But in what would turn out to be his twilight days, I finally began comprehend the magnitude of what his life and struggles mean to so many millions of people. Everything around me is ultimately the result of his efforts. If it weren’t for what he and his fellow revolutionaries achieved, my husband’s family would have been leading very different lives today. And if it weren’t for Madiba, I wouldn’t be here in Cape Town, reaping the benefits of his sacrifices for this beautiful nation. And, if video clips like this and this, and this one below, that I took from the memorial were any indication, celebrate they did. I’m honored to be here to be part of the celebrations. Like everyone else around me, I owe some part of my current existence to him, and I thank him for all he did. 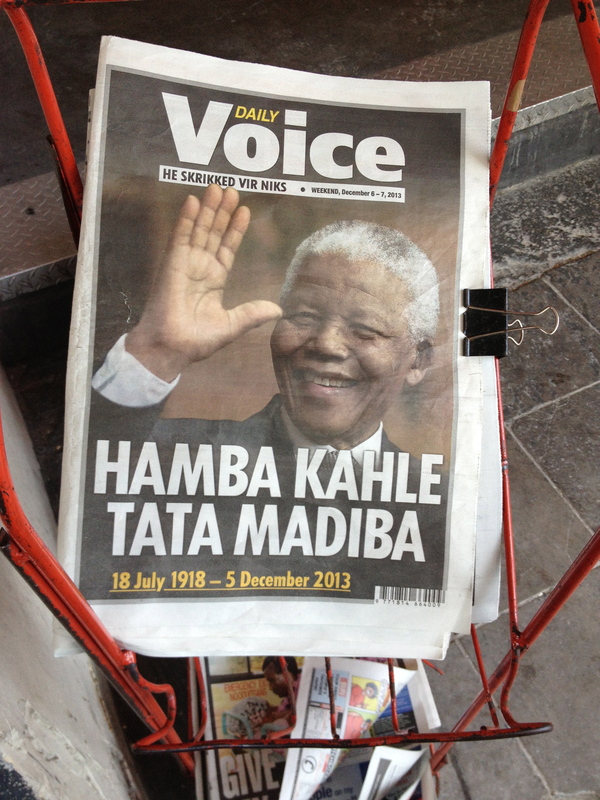 Hamba kahle, Madiba. Beautiful post Sarah..indeed, I think all of us have Madiba to thank for inspiring us, even if we are not South African or if we don’t live there. It’s true…of course it is sad that his time came, but given his message that he spread throughout his life, all of us can pass it on, and keep his legacy alive and well for generations to come – and for someone to leave that legacy, that is indeed worth celebrating and not mourning over. He did his duty to humanity, and hopefully, those of us left behind, will do our part in the coming years, in whatever time we have left.